The Democratic Republic of Congo recently concluded Presidential election was one predicted to signal a new dawn for the country, especially with the ouster of President Joseph Kabila, but growing tension over the election results is giving many little to hope for. From postponement of the election date to delay in announcement of election results and now a growing tension over election results; this is undoubtedly not what many Congolese nationals expected to see at the end of country’s presidential election held on December 30. The country’s electoral commission finally raised the lid on the winner of the election last week Thursday, declaring Felix Tshisekedi of the Union for Democracy and Social Progress (UDPS) as the President-elect. The election results as announced by the commission showed that Tshisekedi won the election with 38.57 percent of the total votes cast. A breakdown of the election results revealed that he received more than seven million votes compared with about 6.4 million for Fayulu, who came second in the tightly contested election. President Kabila’s preferred candidate at the election¸ Emmanuel Ramazani Shadary polled about 4.4 million votes to emerge third. 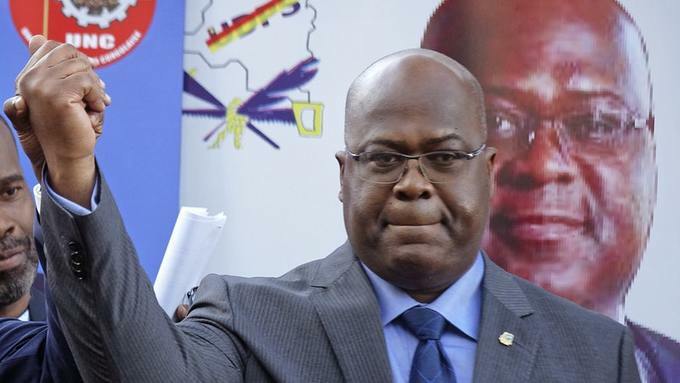 “Having gained… 38.57 percent of the vote, Felix Tshisekedi is provisionally declared the elected president of the Democratic Republic of Congo,” Corneille Nangaa, the head of the Independent National Election Commission (CENI), had announced last week Thursday. The outcome of the election is one that should signal a new down for country’s socio-economic development for many reasons. In the first place, it marked the end of Kabila’s reign, who had been in power since 2000. Analysts argue that an end to his reign is essential to the country’s path to any meaningful growth, and now it’s looking like a prayer answered for many. Furthermore, the outcome of the election should also raise hopes, given the fact that Kabila’s preferred candidate for the election, Shadary, came third in the election- a result many are finding difficult to come to terms with, given that he had the support of President. Aside incumbency factor, Kabila has control of the media and other machinery that could easily have swung the election in Shadary’s favor, so his dismal performance at the polls was shocking and largely disappointing to a segment of the country’s population. Some analysts have earlier predicted that a victory for Shadary would have been an elongation of Kabila’s era- a development that hardly suggests any major hope for the country. Therefore, a break away from Kabila’s era and a victory- which before the election, seemed impossible- for the opposition such as Tshisekedi, some commentators argue, would deepen democracy in the country. In spite of these positives, a looming post-election crisis -earlier reported by CARACAL REPORTS– over alleged electoral malpractices is fueling pessimism rather than optimism. Historically, DR Congo has not seen a peaceful transfer of power since independence from colonial Belgium in 1960, a dismal history, many feared could repeat itself in the face of the growing tension over election results. The events that characterized the 2006, 2011 and 2016 elections- in which security forces killed dozens of protesters in a violent demonstration- are still fresh in the minds of many. Opposition’s Consensus candidate, Fayulu has expressed dissatisfaction with the outcome of the election result that produced Tshisekedi branding it an ‘electoral coup’. Many will be anticipating where the pendulum of the ongoing political tussle in the country’s political space would swing. All eyes will be on the country’s Constitutional Court, who is presently reviewing allegations raised against Tshisekedi’s victory. Fayulu had during the weekend called for a cancellation of the provisional results announced by the electoral commission. “The request seeks the annulment of the result declaring Felix Tshisekedi president,” his lawyer Feli Ekombe told reporters outside the court on Saturday. “You can’t manufacture results behind closed doors,” Aljazeera quoted Fayulu as saying in front of a crowd of his supporters. He had added: “I am hoping that the constitutional court will call the electoral commission to recount the ballot papers. Aside from Fayulu’s protest against Tshisekedi’s victory, the result of the election has also drawn the ire of some western countries. The Catholic Church, for instance, disputed the outcome of the election, after analyzing data put forward by its 40,000-strong observer team. “The results as published do not match the data collected by our own observation mission,” Marcel Utembi, the head of the country’s National Episcopal Conference of Congo (CENCO) said. “We have a recommendation: To publish as quickly as possible all the records and minutes from the counties and the polling stations to allow candidates to compare”. Al Jazeera’s Haru Mutasa, reporting from DRC capital Kinshasa, said judges were expected to meet early next week to go over the supposed evidence that claims Fayulu won the election. “If the judges feel there is no case they will throw the matter out. Felix Tshisekedi will be declared the president-elect and will be sworn in on January 18. “If that happens, some people fear Fayulu could tell his supporters to go onto the streets and there could be an of escalation violence. Not just in Kinshasa, but elsewhere around the country. So a lot of people are calling on the Congolese people to remain calm. “But all eyes will be on the court when they do meet, and a lot of people will be wondering how independent they are going to be”. The Central African country has never had a peaceful transition of power since it gained independence from Belgium in 1960 and it is difficult to keep fears of a seemingly post-election crisis at arms-length. It will be difficult for Fayulu to back down easily on his push to ensure Tshisekedi’s victory at the polls is annulled, given events that preceded the December 30 election. On November 11, 2018; Tshisekedi joined six other opposition leaders to rally behind a single unity candidate, Fayulu, to take on Shadary. But the deal was rejected by the party’s rank and file. Tshisekedi and fellow opposition leader Vital Kamerhe swiftly abandoned the deal and ran on a joint ticket, effectively weakening and splitting the opposition. An encapsulation of a feeling of defeat, betrayal and that of victory, the post-election events in DR Congo are not only threatening the positives of the country’s highly-staked presidential poll but also dashing expectations of the highly anticipated post -Kabila era.